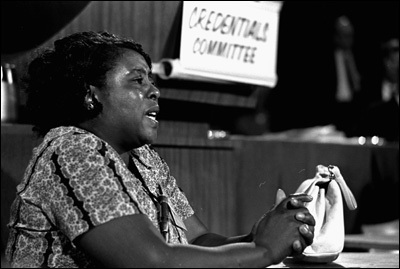 Fannie Lou Hamer's life took a dramatic turn the day she showed up for a mass meeting to learn about voting. It was August 1962 and Hamer, who was forty-four years old, wasn't even sure what a "mass meeting" was. "I was just curious to go, so I did," she said.1 The meeting was organized by the Student Nonviolent Coordinating Committee (SNCC) and Hamer was told something she'd never heard before: black people had the right to vote. One of twenty children born to a family of sharecroppers in the Mississippi Delta, Hamer grew up picking cotton and cutting corn and attended school through the sixth grade. She married a fellow sharecropper and the two scratched out a living doing hard, menial work on a plantation near Ruleville, Mississippi. According to biographer Sina Dubovoy, when Hamer heard SNCC's presentation, she asked herself, "What did she really have? Not even security." A lynching in a nearby town in 1904 had terrorized blacks then, and the ever-present KKK still kept them quiet. As Dubovoy notes, "The Mississippi Delta was the world's most oppressive place to live if you were black. "2 Hamer decided on the spot to register to vote. On August 31, 1962, she boarded a bus to Indianola with seventeen others to try to register to vote. The next day she was kicked off the plantation where she had lived and worked for eighteen years. Her husband lost his job, too. Hamer immediately went to work as a field organizer for SNCC. Returning home from a training workshop in June 1963, Hamer's bus was intercepted by policemen. She and two others were taken to jail in Winona, Mississippi, and mercilessly beaten. Hamer suffered permanent damage to her kidneys. After recovering from her injuries, she traveled across the U.S. telling her story. With her genuine, plainspoken style, Hamer raised more money for SNCC than any other member. SNCC had formed the MFDP to expand black voter registration and challenge the legitimacy of the state's all-white Democratic Party. MFDP members arrived at the 1964 Democratic National Convention intent on unseating the official Mississippi delegation or, failing that, getting seated with them. On August 22, 1964, Hamer appeared before the convention's credentials committee and told her story about trying to register to vote in Mississippi. Threatened by the MFDP's presence at the convention, President Lyndon Johnson quickly preempted Hamer's televised testimony with an impromptu press conference. But later that night, Hamer's story was broadcast on all the major networks. After they told me, my husband came, and said the plantation owner was raising Cain because I had tried to register. Before he quit talking the plantation owner came and said, "Fannie Lou, do you know - did Pap tell you what I said?" 1. Sina Dubovoy, Civil Rights Leaders: American Profiles (New York: Facts on File Books, 1997), 101. 3. Jerry DeMuth, "Tired of Being Sick and Tired," Nation, 1 June 1964. Reprinted in Reporting Civil Rights: Part II: American Journalism 1963-1973 (New York: Penguin, 2003), 99-106. 4. Clayborne Carson, In Struggle: SNCC and the Black Awakening of the 1960s (Cambridge: Harvard University Press, 1981), 124-25. 5. Dubovoy, Civil Rights Leaders, 108.